At Walsh Construction Co./WA, out motto is “Building Smart, Building Green, Building Community.” But truth be told, the buildings we construct often say more about our clients than they do about us. While we may advise clients on best practices, mechanical systems and industry trends, a green building gets its distinction and designation from the original vision. In the Pacific Northwest, Walsh has partnered with many visionary clients. Even when sustainable design was still considered a fad, we were working on many firsts and today have completed 56 LEED-certified buildings, more than 50 BuiltGreen-certified buildings and 23 BuiltSmart-certified buildings. While we pride ourselves on our green portfolio, we believe that to become a critical contributor in sustainable development requires us to become a leader within the building trades. For a construction company, the way we work can have as much of a conservation effect as what we work on. For the gabion walls, nearly all material waste was eliminated by reducing the height by 3 inches so that exactly two sheets of welded-wire could be used for each section. So, when Walsh was selected to build the Greenfire Campus project, we were ecstatic. Employing the project’s “sensible sustainable” design principle, we challenged our team to set a new standard for environmental practices on the job site. The result is empowering. • Paperless challenge. Construction has traditionally involved a lot of documentation, which translates into mountains of paper. The team challenged itself to build Greenfire “paperlessly.” The result is that nearly all paperwork related to the project  requests for information, change orders, correspondence and most submittals  were distributed electronically. Meetings were conducted using a projector rather than paper agendas or minutes. We created a digital plan center, which was an on-site kiosk for subcontractors to review updated as-built drawings. This plan center was also available from any computer or mobile device. • Smart-sizing dimensions. Walsh and Johnston Architects strived to identify areas where design could be slightly adjusted to significantly reduce waste generated during construction. One design element of the project is the gabion walls, or welded-wire baskets filled with rock, used as retaining walls around the site. We found that by reducing the gabion walls in height by 3 inches, we were able to use exactly two full sheets of welded-wire for each wall section, eliminating nearly all material waste for this scope. • Smart ordering and using scraps. Whenever possible, we purchased only the materials necessary to build the project and ordered materials such as siding panels pre-cut to avoid generating waste. And we reused materials throughout the project. For example, the tool shed next to the P-patch gardens is made from leftover siding scraps, and the windows and door from the project mock-up. • 99 percent waste recycling. 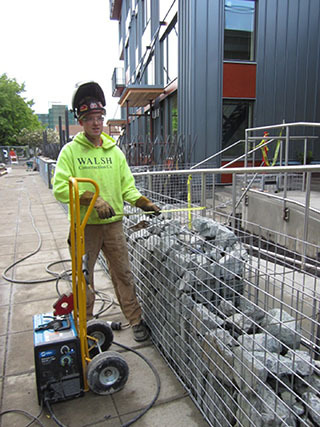 On Walsh projects, we generally recycle more than 90 percent of the construction waste and debris. At Greenfire, we raised the bar to more than 99 percent of the waste. We believe that our industry is just starting to see how we can do more to green the actual work of construction. Through unique projects such as Greenfire and our own business practices, we believe the green challenge is shaping future behaviors. Elizabeth Rinehart is the project manager of the Greenfire Campus project for Walsh Construction Co./WA, a mid-sized general contractor specializing in mixed-use, multifamily, student housing and affordable housing projects.